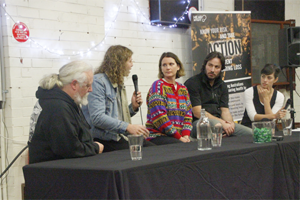 June 2016: In association with our friends at Music Victoria, we gathered a great panel together last week for a lively debate on hearing health in the music industry. We were delighted to be joined by Jo Syme, the drummer from Big Scary, Jon Perring, owner of Bar Open and the Tote, as well as Dan Corless of Wick studios and Simon Aarons, a live sound engineer and musician. Our own Siobhan McGinnity was moderator for the night – bringing along her own perspective as a researcher in this field, a qualified audiologist and audiology lecturer, as well as a musician in her own right. After an introduction from Music Victoria CEO Patrick Donovan, topics ranged from how people felt about their own hearing health and measures they did or didn’t take to protect hearing around loud sound, to creative solutions that could improve sound management and exposure at live venues. Unsurprisingly, it’s a tricky topic to navigate with venues, musicians and sound engineers all contributing to how sound is managed and delivered on any given night– and of course the overriding desire to deliver a great gig for patrons at any venue. Added to that, live music is so often about the moment and the vibe, and a part of that which is often related to also volume. The panel agreed there are certainly challenges aligning performances with measures to protect hearing health in the long term. The panel was very balanced in their discussion, and despite the clear challenges, showed real support for improving awareness of the risks and possible consequences of loud sound in the live music sphere. They were also keen to advocate for better information and education for musicians and sound engineers, and if possible simple, easily implementable solutions for ticket sellers and venues. So, big thanks once again to all involved and to everyone who joined us for the evening – it’s given some great insights for us to chew over here at HEARsmart and some ideas to hopefully start working on with Music Victoria and others in the future. Sensaphonics, founders of the Hearing Freindly network, put together a short video of the evening you can watch below or you can listen to the whole discussion on soundcloud (the link is on the right).